Do the packages include high res images? Yes, all package include the high resolution images that will be put on a custom website made for you and your guests. You will be able to access, view and share your photos and download all your high resolution images. With a usage release letter, you will be able to take your images to your lab of choice to make copies and create enlargements. We like to call our style a "hybrid" photography style. We love the candid and documentary approach and snap away while your day unfolds, while understanding that all weddings must have some posed formal photos. With a fun and calm approach, we love to be creative and will guide you to capture your love story while letting you enjoy your day. We want you to relax and leave the hard work up to us. There are many precious moments throughout your day to capture and they are happening so fast and you don't wanna miss them. Having a second professional photographer is very useful, and it is sometimes required, depending on the size of your wedding. The benefits of having a second photographer is worth it and when you hire both Angie & Greg for your special day, it always flows and is seamless. Greg can hang with the guys and Angie is with the gals during those fun anticipation and getting ready moments leading up to the ceremony. Do we need a 2nd photographer? Should we have a 1st look moment prior to our ceremony? The "1st look" moment takes place prior to the ceremony where the Bride & Groom see each other in an intimate location and it's all captured in privacy and you get to take a few moments to just yourselves before the whirlwind effect of your wedding day sweeps you away. Essentially, it helps break up the day so you can enjoy it and take it all in. This way you can take pleasure in hanging out with your guests shortly after the ceremony and make your day that much for wonderful by 'slowing' it down. If you are totally not for it and would rather be traditional, we totally honor that too. With good coordination and timing, we can make it all happen. As photographers, we feel a responsibility for you to enjoy your day. In turn, we get beautiful photos where you look truly happy and stress-free! It can be overwhelming taking photo after photo when all you want to do is enjoy your reception with family & friends. Your day doesn't have to be hectic and we can help SLOW it down with a little planning ahead. We require 50% down along with your signed contract to book the date. The final 50% is due 30 days prior to the wedding date. Yes, we have a lot of reviews to check out. Here is what our awesome clients are saying about us at WeddingWire.com or you can check out the more reviews on Yelp. Yes, we do. Please let us know if your venue needs our info. Do you have a preferred wedding vendor list to share with us? 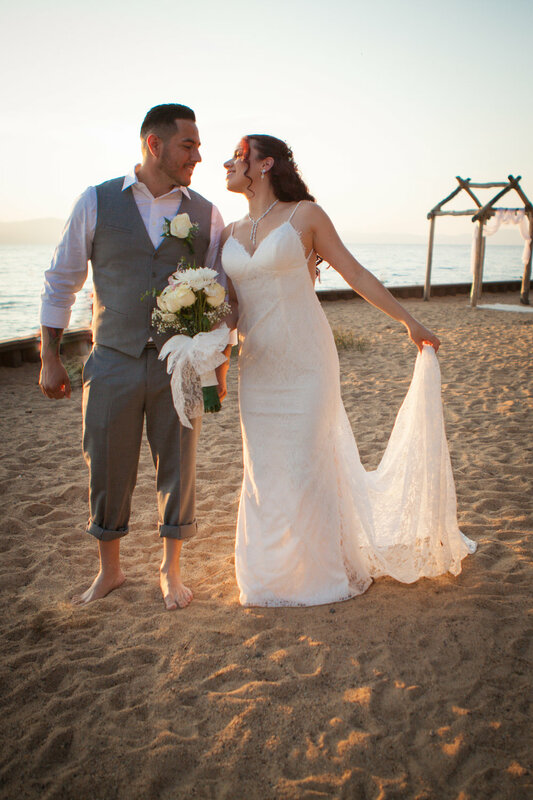 Yes, we’d love to share the best of the best in Lake Tahoe Weddings with you so that you have the best “A Team” by your side make your special day extra amazing. Woohoo, look at you! You made it through the (not so) fun stuff. If you're still hanging around this long, we really think you should call or e-mail us so we can chat about your upcoming Lake Tahoe wedding. Promise it will be awesome!